The financial industry is diverse, encompassing a variety of sectors including insurance, banking, financial services and advising and more. While businesses in these sectors provide valuable products and services to both businesses and consumers, they often require creative and knowledgeable marketing as well as innovative public relations, social media and digital strategies to support brand awareness. 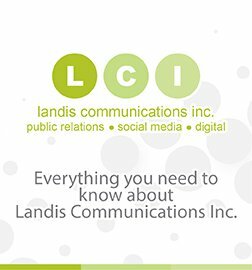 The Landis Communications Inc. (LCI) team, headed by 30-year marketing/communications financial services veteran Sean Dowdall, includes a number of skilled professionals who specialize in public relations, marketing, investor relations, social media and digital strategies for financial organizations and institutions. A key differentiator is LCI’s proprietary Promised Results program, which provides clients with tangible ROI metrics. From providing counsel to organizations considering expansion to managing marketing/communications campaigns related to new and existing products and services, LCI goes above and beyond to help financial clients build the customer base while achieving identified business goals.